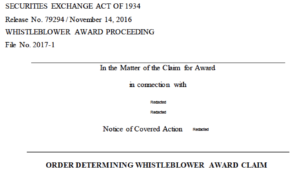 On November 14, 2016, the SEC issued an Order determining three whistleblowers’ separate award claims. It granted one claimant an award, while denying SEC whistleblower awards to two other claimants. The Order is interesting in that all three decisions were based in part on the requirement in the SEC whistleblower rules that to be eligible for an award, a whistleblower’s information must “lead to” a successful SEC action. This is sometimes referred to as the SEC whistleblower lead to rule. The SEC’s Claims Review Staff (“CRS”) found that the first claimant provided the SEC with original information of which the SEC was previously unaware. That information caused the SEC to open an investigation, and it ultimately resulted in a successful SEC action. The information therefore satisfied the SEC whistleblower lead to rule. The CRS’s Preliminary Determination recommended that the first claimant receive an SEC whistleblower reward. In an unusual twist, the Commission departed from the amount of the award that the CRS recommended for the first claimant. After reviewing the administrative record, the Commission found that the first claimant came forward promptly, subsequently alerted the SEC to additional information, enabled the SEC to move quickly to shut down the fraud, and enabled the SEC to recover nearly all of the investors’ funds. Because the first claimant’s information and actions led to these noteworthy results, the Commission increased the amount of the award over what the CRS had recommended. According to the Order, the increased amount should result in the first claimant receiving an SEC whistleblower award of at least $20 million. By contrast, the SEC’s Order stated that neither the second claimant nor the third claimant demonstrated that their information led to the success of the SEC’s action. … original information “leads to” a successful enforcement action if either: (i) the original information caused the staff to open an investigation, reopen an investigation, or inquire into different conduct as part of a current investigation, and the Commission brought a successful action based in whole or in part on conduct that was the subject of the original information; or (ii) the conduct was already under examination or investigation, and the original information significantly contributed to the success of the action. In addition, according to the Order, some of the second claimant’s information was not considered “original information” under the SEC whistleblower rules, because the Commission already knew the information before the claimant provided it.